I've just watched the video of your performance at the Mall of America. Is this the career trajectory you were envisioning when you won a few rounds on American Idol and decided to leave Navy music? I'm just guessing, but this video makes a solo mall gig look like less fun than a mall gig with a Navy band. This is hard to imagine; Navy mall gigs are so close to the bottom of the Fun Ladder that it's hard to contemplate the existence of an even lower rung. Phil, if you want to play in malls, have you forgotten that we MUs invented playing in malls? We've never loved doing it, but it's part of the job, and we do it as a team. I guess it's about teamwork. Misery shared is misery lessened. Hell is a lot more endurable when you have shipmates roasting alongside you on the eternal rotisserie. Come home to the Navy, Phil. You'll never again have to stand alone on an empty stage singing to karaoke accompaniment while the red-faced assistant manager of the Gap is shaking his fist because you're blocking access to his store. Not that those indignities will disappear if you come back to the Navy. They won't. On your first mall gig, the head clerk of Sharper Image will start pounding on the edge of the stage, screamingthat the music is too loud and he's losing customers to Best Buy. But you won't suffer alone. You'll do it with your shipmates. Come home, Phil. When it comes to mall gigs, Navy bands are the pros. In fact, to a lot of people we're the real American Idols. For years, Tower of Power trumpeter Mike Bogart has had only good things to say about Navy music; after all, he was an MU for a decade. During the 11 years since Mike has been out of the Navy, his career has been a trumpeter's dream; he played with the Maynard Ferguson band before taking his current position with Tower of Power. Mike's career will take another turn next week in San Diego. He'll walk on stage for his last performance as Mike Bogart, Tower of Power trumpeter, and walk off as MU1 Mike Bogart, USN. During the show, Lt. Mark Corbliss, Officer in Charge of Navy Band Southwest, will administer the oath of enlistment. Petty Officer Bogart will soon report to Annapolis for duty with The Electric Brigade. Clearly, for a musician of Mike Bogart's caliber, there's nowhere to go but up. Full story with photos at San Diego's official Navy newspaper, Navy Compass. The August issue of the International Musician features a profile of former Navy musician, MUCM Manny Cepeda. 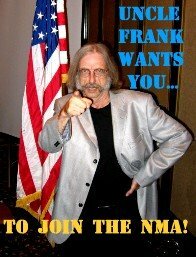 The IM is no fan mag; it's the official journal of the American Federation of Musicians. When you get featured here, you're doing things right. Manny, the article points out, is busy as a San Diego composer, performer and educator and band leader. This, of course, is nothing new. During his 31 years of service, Manny led the Steel Band and the U.S. Navy Show Band. Here's a short clip of Manny Cepeda (in the white hat) performing at Harrah's.